I swung around and looked at them thinking they must be joking. “What’s parkrun?” I then realised they were being serious and I was taken aback. Parkrun is always a consideration of what I’m doing on a Saturday morning. Although I don’t make it that often, there’s normally a chance I could make it. After BMF or before BMF in Bushy Park. Running up the hill from home to the Windmill on Wimbledon Common. Taking a drive to Rosliston Forestry Centre when I’m home to see my folks. Heading off to the beach in Gdansk when I’m staying in Poland. For me, it’s part of my life and my weekend, and that’s why my reaction to my colleagues was so strong and my confusion was so, confused. For the uninitiated, parkrun is a free, weekly, 5km timed runs that tend to take place in a park. They are open to everyone, free, and are safe and easy to take part in. At the start of October 2018, the 5,000,000th person to register for Parkrun. There are 1,800,000 registered with them in the UK. 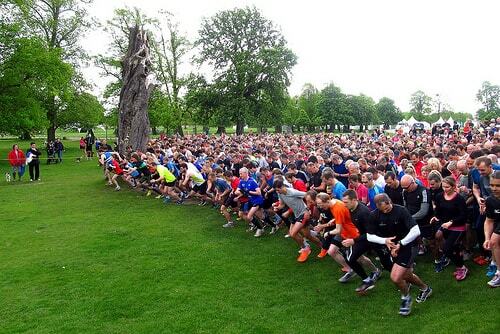 On a good weekend, some 250,000 people around the world complete a parkrun. It’s the largest sporting event in the world and it happens without fail every Saturday. It’s done a massive amount to people’s wellbeing. For every person who joins parkrun and decides to get a bit fitter are potential savings on the NHS budget. In 2005, the average finish time was 22 minutes and 16 seconds. Currently, its 28 minutes and 28 seconds. At first glance, you would think this statistic is going in the wrong direction, but it explains a lot more. The inclusivity. A colleague recently replied to my question of if they go to parkrun “I have to get my times down before I can go”. That kind of misses the point of parkrun. If you want to get your times down, the best thing you can do for yourself is to go to parkrun. The range of people at a parkrun is phenomenal. From the good club runners who are disappointed with 16 minutes, to Mums with children, Dads with pushchairs and/or dog, peoples starting a weight loss journey to the pensioner who wants to have a walk and chat to a few people. The mental and social side cannot be overlooked. I’ve heard people say “It’s like church but on Saturday. With lycra”. A friend of mine Marketa recently moved to New Zealand. As a send-off, we all went to her local parkrun. In doing this she created a number of debutant parkrunners. Then moving to a country 11,500 miles away, where she knew nobody, the first thing she did was to go to parkrun in Wellington. It’s a great way to meet new like-minded people. I’ve bumped in ex-work colleagues I’ve not seen for years at parkrun. Or members of my teenage athletics club, 30 years on. I often catch a friend of a friend at Bushy Park around the 1 km mark. We have a little chat and then one of us pushes on and we then chat afterwards. Another great statistic is around 8,000 runners a year subsequently joining an affiliated running club after starting Parkrun. You can read my thoughts on the benefits of joining a running club (physically and mentally) here. 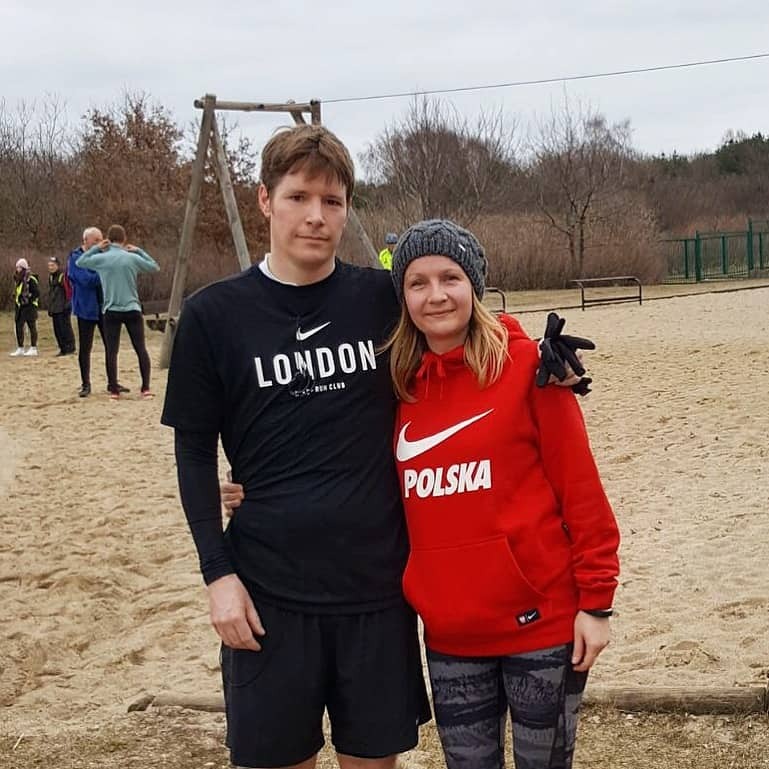 I met a friend off the internet via parkrun. I already followed Ash, fatboynowslim on Instagram and his LON-DONE bid to complete all London parkruns (which he has recently just done). When he visited Wimbledon Common I met him after seeing his post that it was next on his list. I’ve since caught up with him at a number of races around London. I see that it’s the case at many of the parkruns he attends, that he commonly meets up with others and has quite a community going. There was an interesting article in the Guardian a few weeks ago about “people’s innovation” that is driven by users rather than producers, by volunteers rather than professionals, just like parkrun. 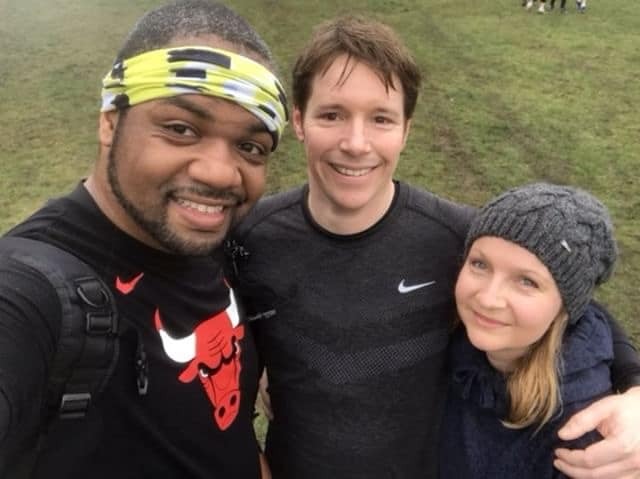 In the article, founder Paul Sinton-Hewitt mentions people commonly ask him “Where’s the trick?” This is one of the many reasons I love parkrun. It’s a not-for-profit organisation that could be spun out a dozen ways to make money (they do t-shirts and wristbands), but it’s not. People are clamouring to be associated with it and catch a bit of its juju. 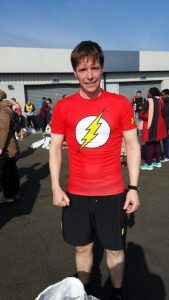 Pro-Direct Running provides the milestone shirts. Vitality Health and Life Insurance (not many people’s favourite people, but they are innovating and encouraging people to get active) is a sponsor. CSM Active who organise the Adidas London City Runs is a partner. I suspect that many sponsors and partners are carefully selected to be connected with and match parkrun’s aspirations and that many are rejected. If you’ve not made it to Bushy Park where parkrun was founded (14 years ago with just 13 runners) it is well worth a visit. I regularly see minibuses with running clubs making their pilgrimage. The website says its averages 679.5 runners per week (possible taking into account many previous years’ numbers). It maxed out at 1,705 in its biggest week, but I estimate it must easily average 1000 runners a week now. The finishing funnel is getting ever longer and needs an army of enthusiastic volunteers to keep it moving.